RDRS Bangladesh job circular published New job vacancy at www.rdrsbangla.net and our website . 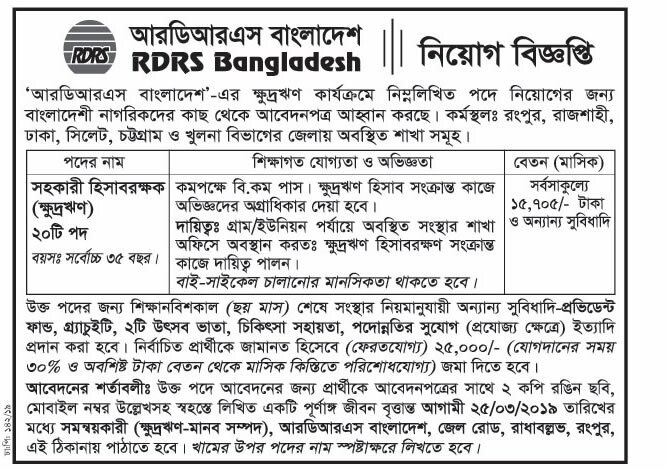 RDRS Bangladesh job circular offer some job vacancy in this post. RDRS Bangladesh Offer some job post for HSC Pass Student.Masters Pass Student apply in this RDRS Bangladesh job circular 2019. You Must have to apply before March 25,2019. RDRS Bangladesh is inviting applications to fill the position of Implementation Officer of No Lean Season Project under Microfinance Program. Educational Qualification: Masters in any Nutrition related subjects from any recognized universities/ institutions. Masters in Nutrition/ Applied Nutrition preferred. Salary Range: Tk. 15,705 (Monthly). If You want to apply RDRS Bangladesh job circular through online you have to visit by www.rdrsbangla.net . For Next Updates about RDRS Bangladesh Job vacancy Notice stay with us. This entry was posted in NOG Jobs, Sylhet and tagged New job vacancy 2019 - www.rdrsbangla.net, NGO jobs, RDRS Bangladesh Job Circular 2019 by Raju Ahmed. Bookmark the permalink.